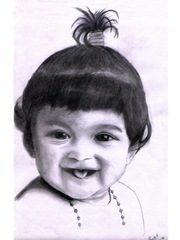 I sketched this portrait of a baby for a relative of mine. This entry was posted on Thursday, May 7th, 2009 at 11:37and is filed under . You can follow any responses to this entry through the RSS 2.0 feed. You can leave a response, or trackback from your own site. This one is awesome…which on contrary doesn’t implies that the others are incompetent..this one is so cute..literally it reminded me of Lord Krishna in his childhood. He he..we never saw him …just have some mythological myths that he looked similar to what you have sketched..